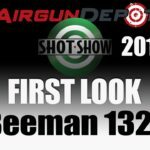 SHOT show 2019, I’m at the Beeman booth giving you a first look at the Beeman 1327. Now this is a gun that’s based on the Beeman Chief Platform, but as you see it’s got a multi-shot magazine here. The Beeman Chief can be an incredibly accurate gun, you get good power, but now it’s upgraded with this magazine. All comes it also comes with a single shot tray. We’ll be looking to see these sometime around to April and the price should be about $200. For more SHOT show coverage stay tuned.